(Phys.org)—Boeing has been working on a project that signifies the future of commercial air transportation. As the story goes, about five years ago at a conference on advanced aircraft technologies, posing questions on what the future of aircraft would look like, somebody stood up and said, "What about an electric airplane?" Almost everyone laughed. Boeing personnel did not laugh. Can we make an airplane that has batteries that actually works? 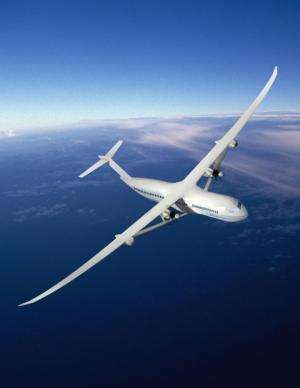 They took it as a challenge, in designing a commercial plane capable of low-emission flights. Marty Bradley, technical fellow with Boeing Research & Technology, and part of its SUGAR (Subsonic Ultra Green Aircraft Research) project, has been talking about the company's hybrid electric design, the SUGAR Volt, ever since. This is designed as a plane that will combine electric power with traditional fuel. Boeing sees it as an energy-efficient model for future commercial flying. The Volt concept is a hybrid propulsion system, using both jet fuel and batteries, a greater wingspan and open-rotor engines. It plugs in at the airport, charges its batteries up, and flies its mission. To enable portions of flight with low or zero emissions, electricity is used as a supplement or replacement. Dual-turbine engines would be powered by traditional jet fuel, and at cruising altitude, the system could turn over to electrical power. Adding energy-plus points, the SUGAR Volt's longer wings allow for greater lift and the wings can fold when landed to accommodate airport gate space. Boeing noted that the fuel burn reduction and the 'greening' of the electrical power grid can produce large reductions in emissions of life cycle CO2 and nitrous oxide. Hybrid electric propulsion also has the potential to reduce noise. In the SUGAR study, the team reported that hybrid electric engine technology was a "game-changing technology" and a "clear winner" because it met NASA's goals to reduce fuel burn, greenhouse gases, nitrous oxide emissions, noise and field length. Bradley recently said that Boeing is looking at a 2030 to 2050 time frame for the SUGAR Volt. Earlier this year, Bradley said that "There is a lot of uncertainty as to how good batteries will be in 2030 to 2050. But we are quite encouraged to see battery companies starting to show real products with much higher performance." On the larger scale, Boeing's SUGAR team is working to identify future commercial transport concepts for NASA. The team is looking at various concepts and technology options for future years. These include hybrid battery-gas turbine propulsion, fuel cells, fuel cell–gas turbine hybrid propulsion systems, cryogenic fuels, cryogenically cooled engines and associated technologies, advanced batteries and open rotor/turboprop technologies. The SUGAR Volt, one of the concepts, shows potential to meet NASA's environmental goals, as the SUGAR Volt will emit less carbon dioxide and less nitrogen oxide than aircraft in operation today. Hybrid is a concept making frequent news in aviation on other fronts. According to reports in November last year, Israel's El Al Airlines planned to outfit 20 of their Boeing 737s with electric drive units that will provide power for the planes to taxi while on the ground. Several other companies were exploring similar ideas. Bloomberg this year reported that airlines continue studying new technologies and one study area, similarly, is taxiing. Equipment makers such as Honeywell are devising electric motors that can move jets, which would allow pilots to taxi without having to depend on main engines or diesel tractors. The first new aircraft with electric-taxi technology may be in production in as few as three years, according to Bloomberg Businessweek. There's better options, if only our culture was more interested in being slightly more efficient, rather that slightly more "convenient". Clearly, this technology is a trade-off between pleasing the passenger, who wants to get somewhere immediately, and cutting fuel costs. No mention of any kind of solar panel technology to help re-charge the batteries, but at this scale for winged aircraft, it might not be worth the extra weight. On the one-manned "Solar One" aircraft experiment, the panels were able to charge the battery more than the amount of charge consumed during 26 hours of continuous flight, so that they landed with a higher charge than they started. If you can charge batteries through solar power half as quickly as you are using them, you actually double max range for daytime flights, or at the very least reduce ground charge time by half. Because it's dumb? Do the math: Solar constant times surface area times efficiency of solar panels - the additional energy you'd get would be pitiful compared to the energy requirements of a plane (this is also the reason why you don't see solar panels on cars). If you plastered the entire plane you could probably run the air conditioning. That's about the size of it. "the aircraft had insufficient solar cells for sustained flight"
Why do otherwise numerate folks lose the ability to calculate when discussing "green" tech? The fantasy desire for unicorn faerie tech over rides common sense. The hyperbole sets expectations that demeans serious efforts to utilize solar, etc. in appropriate applications. Why do otherwise numerate folks lose the ability to calculate when discussing "green" tech? Amen, though I would not only apply this criticism to clean tech. It seems that as soon as any kind of science is discussed in these comment sections people just switch of their brains and start spouting techno-babble without any attempt at looking at whether it makes even the remotest numerical sense. I actually watched a documentary on it, with live action videos from when they were doing the test run. The started with less than half charge in the batteries and ended with more charge than they started. What I am unclear about is how the batteries of the SUGAR VOLT would power the aircraft.Would it spin the turbines with electric motors? If so,it would take a hell of a lot of juice to give enough thrust for cruising. The plane is designed to be recharged at the airport, so it's also possible that it would have smaller combustion engines. Rereading the article,it says the concept uses dual-turbine engines,so I assume one turbine would be spun by an electric motor,and the other by combustion gases? Sounds like a flying Prius. Also, let us not forget to keep reserve power available for emergencies --such as a supposedly clear runway that isn't. The notion of using electricity for a transmission medium is interesting, but ultimately foolish. If it is going to be used in the same manner as the turbo-fan engines, then we're not going to see much improvement. On the other hand, if we consider making a more efficient aircraft through the use of differently ducted fans, that COULD do quite a bit. Aynway, higher survival stats without explosion during emergency landing or crash landing... and should be way cheaper right? With much less maintenance. There are better ways to implement a hybrid system that do not require carrying heavy batteries. If the idea is to cut fuel costs, then why add to those costs by increasing the payload? Why not just use less fuel? Yes,crash fires make survivable crashes fatal.Too bad they can't carry fuel in drop tanks on the wings,but that would no doubt cut into efficiency. The video concept says it will run the turbofans on battery power. The reason this works is because batteries are far more efficient than generators, therefore they are much cleaner as long as the electricity for the charge is coming from a clean source. If the electricity for the charge is coming from a coal fired power plant, then this is probably still cleaner than jet fuel, but just barely; probably not enough to matter. Even if it were the same then it would matter - because dispersing water vapor and greenhouse gases way up in the atmosphere is a lot more damaging than closer to the ground (and powerplants can have exhaust treatment facilities which planes don't habitually lug around). A quick google shows that coal powerplants and airplane turbines have about the same power conversion efficiency (40%). I never heard of exhaust scrubbers for jet engines.Electric powered cruising therefore becomes much more important for the environment. Batteries aren't 100% efficient though. I doubt they get coal fired power plants to 55% Carnot efficiency. The most efficient diesel engines are on super tankers, and those are only 50% efficient. Electric motors (especially the more powerful ones) are around 90% efficient. However the energy/mass ratio for batteries is significantly smaller than for fuels (which has to be factored in because it means we'd either need more flights or larger planes - both of which means more hydrocarbon fuel needed due to more takeoffs or takeoffs of planes with larger mass). But I'm guessing the Boeing guys have figured that in. In summary: I think it's an interesting proposal and certainly a first step worth taking until we figure out how to go either fully electric or hydrogen for planes. Zinc-air batteries are interesting for the weight issue (and also for the availability of zinc which is much greater than that of lithium). However, the current types do not allow frequent recharging. This means once they wear out they have to be rendered down (in essence: molten), the metal separated and then rebuilt which takes an enormous amount of energy. (Current) lithium ion batteries cab be recharged roughly an order of magnitude more often than (current) zinc air batteries. but those are still just lab prototypes. Whether that will work in industrial/real worls (and weather) setting isn't out yet. Cleary, Boeing stronly feels the threat from electricity-driven high speed train. China's new operational bullet train travels over 2000kms in 8 hours. Experimental models in lab can move over 1000km/hour, which is as fast as the plane. So, in only a few years, do we still need planes? Technical challenges exist but are they insurmountable? What part of the American culture lead to the creation of "professional naysayers?" On the other hand things are happing now that should never have happened - like the national debt of the USA. but that's another story. Yes, we'll still need the planes. Trains can only go where there are tracks, and much of the cost of high speed trains is the track and other right of way. A plane can go anywhere there's a runway long enough to land it. If the train runs from A to B, and one wants to go to C, one needs new tracks. To fly A-C instead of A-B all one needs is a runway. Cars can only go where there are roads. How did people manage to build so many roads? It's a matter of what benefits the oil industry, when the country is controlled by oil companies. Building airports are not as simpe as building run ways. Plus the huge amount of oil consumption, tracks are much cheaper. As soon as you build tracks, people will move to live where there are tracks. That was how cities came into being. ...That was how cities came into being. Not true. It just made them grow faster. But I'm only quibbling. quit nit-picking ideas and efforts others have made - at least they are doing something about a problem. THis is pure balderdash. And, if one will take a moment and check where the money for this boondogle came from, you will find the federal government wasting the tax dollars of kids that aren't even born yet. A first year physics student with a $10 calculator can blow this idea up in 5 minutes. What criminal insanity! Serial Hybrid electric drive technology is old news. one hundred years old. Our current technology is making it commercially viable. Pure electric aircraft, outside of RC models, are not viable for people. This is not the "Phoenix". Serial hybrid drive using turbine co-generators to drive electric high efficiency turbofans or prop planes are VERY VIABLE. Siemens already did it in 2011. Increased efficiency and lowered cost of operation will win. Follow the money. Aircraft companies will develop and produce what they can sell. If it is more efficient,and serial-hybrid and some parallel or mixed systems are, then it is coming. Bank on it. Batteries are purely a minor power backup, if included for drive power at all, NOT a primary drive source.